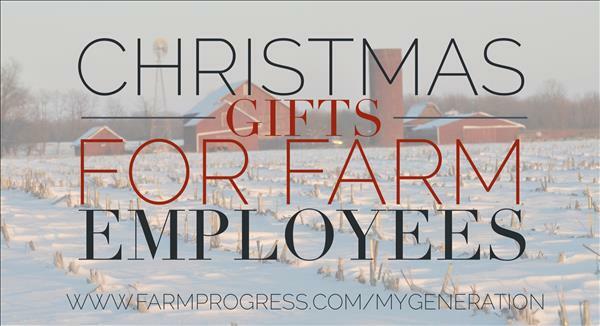 What to get for your farm employee for Christmas? Check out part three of the Christmas Gifting Series here! There is nothing quite so valuable on the farm as a solid farm employee. Amen? So with the clock winding down and with gifts for farmers secured and gifts for landowners figured out, here are a few ideas for showing your appreciation for a year's work well done. These ideas, gathered from farmers and ranchers across the country, will hopefully give you some inspiration. And a note: I love the practical nature here. You can find all sorts of random ideas online – like an actual cookie made in your employee's likeness – but every farmer and farm employee I spoke with favored useful, practical items. Or, you know, just cash. Read on! Cash: I know. It's obvious and maybe it seems cold. But everyone loves a little extra, especially at the holidays. It's not a bonus tied to production, nor to profit sharing. Just something extra, as a way to say thanks and well done. Also very common: cash with a little something extra, from the list below. Farm gear: Hats, coats, sweatshirts, etc., with the farm name or logo. Always good with aforementioned cash bonus, and they can be extended to their family members: who isn't at least a little pleased with a pint-sized hat or coat for their little guys? Concert tickets: A great idea for the college employee, assuming you have some degree of knowledge about their taste in music. Restaurant gift card: A classic. Also great for young families. Meat: This can come in a variety of forms. One farmer I spoke with took orders at the first of the month: spiral ham, bone-in ham, two pork loins, beef roast, steak, etc. – he lets them choose and delivers closer to Christmas. Other ideas: gift card to the local meat locker. For animal protein, all the year long. Supplier gift baskets: Kilgus Dairy wins for both creativity and deliciousness: they sell milk directly to Chicago retailers, including a specialty chocolate shop. One year, Jenna Kilgus brought home gift baskets from that shop for everyone. I so want to work for her. Getaway: How about an overnight (and meals) at a regional getaway? Something like the Grand Bear Lodge in Utica, Ill., comes to mind – complete with indoor waterpark. So great for young families. Farm supplies: Some employees might also like a gift card to your local farm supply store, or even a Bass Pro Shop, if you have one nearby. Good local shoe stores are a good option, too, if they carry work boots or if you know your employee is a runner or has a special interest like that. Cell phone: Whether this counts as a gift would depend entirely on how you structure your pay and benefits. On some operations, paying a cell phone bill might be part of the benefit structure; on others, it might be a great Christmas bonus. Note: A late addition! TOY TRACTORS. I can't believe I didn't include this one, until one of our former employees reminded me. My husband has long given a really nice toy tractor to the young men who have worked for us seasonally - often high school kids during the summer and after school. As our friend said it best: "Money comes and goes but toy tractors last forever!" Amen.